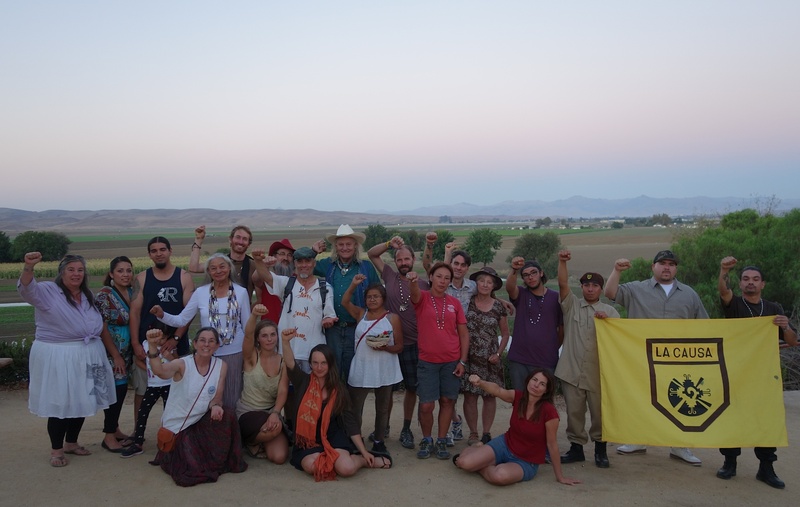 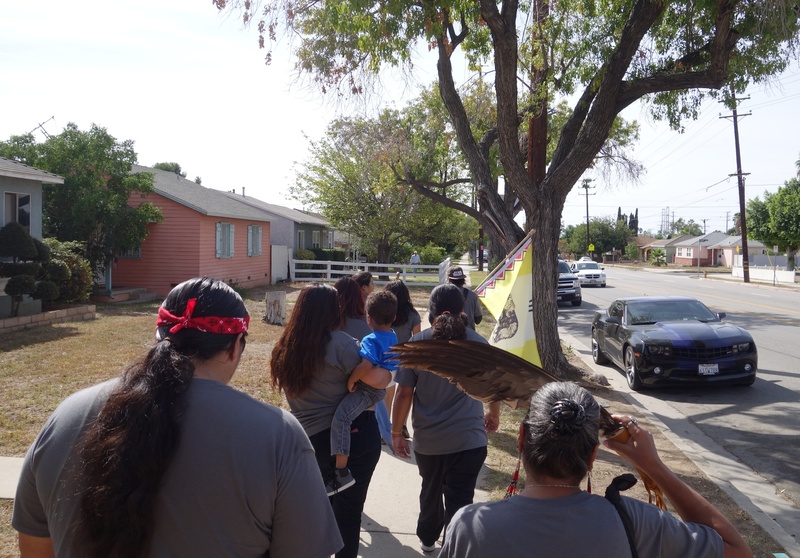 On November 7th 2015, the Walk for the Ancestors reached its final destination at Mission San Diego after two months and what turned out to be over 780 miles of walking. 130 people joined together at dusk for the final ceremonies, including representatives from numerous Kumeyaay communities and reservations. Stanley Rodriguez from the Santa Ysabel reservation opened the gathering with a booming voice, speaking first in the Kumeyaay language, then translating to English. 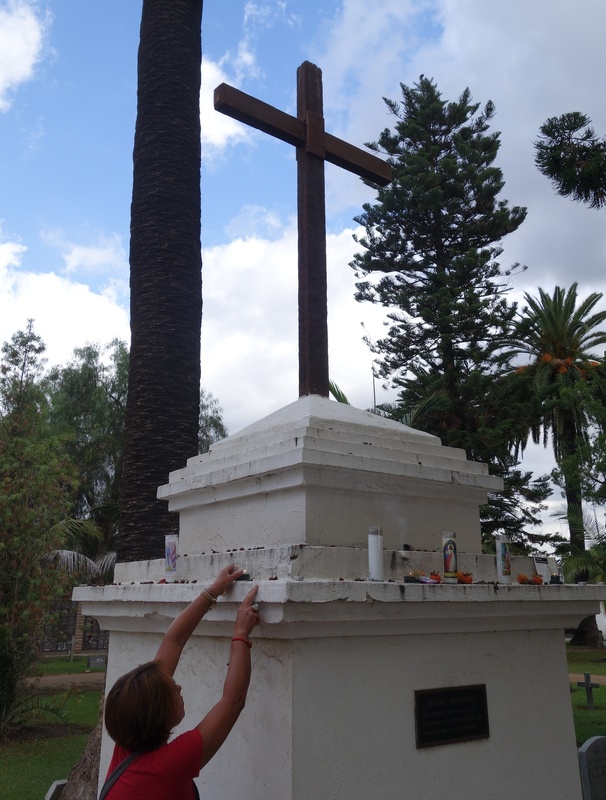 Caroline Ward Holland lighting candles and sage at the only burial marker on the SLR mission grounds for the 4,000+ Indians buried there. 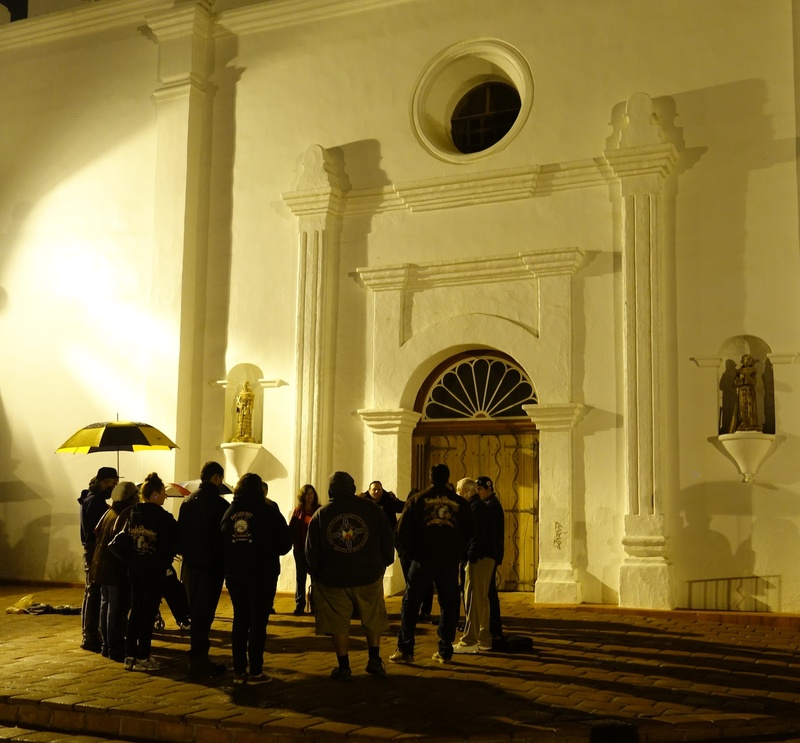 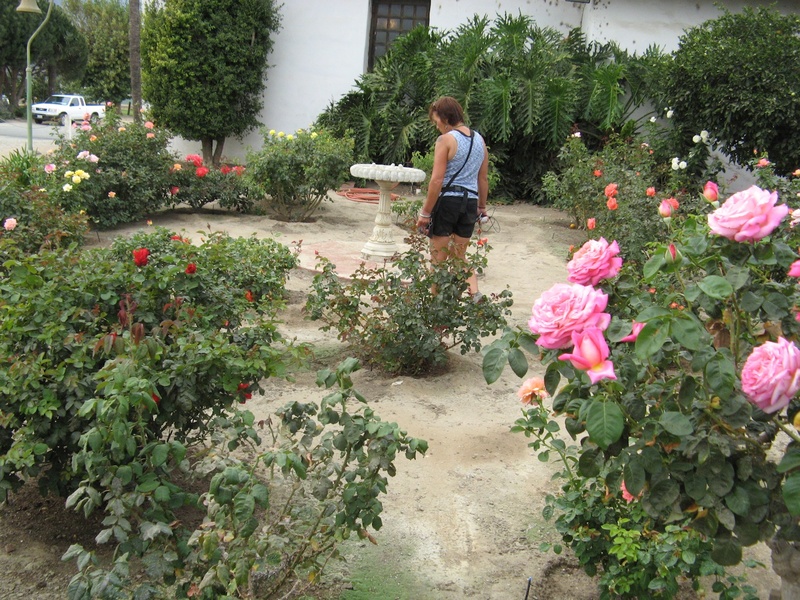 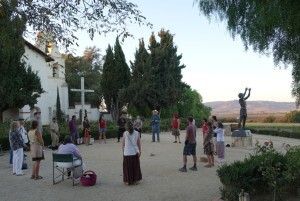 On Tuesday at 5:30pm in from of Mission San Luis Rey, we stood on the steps of the chapel in pouring rain. 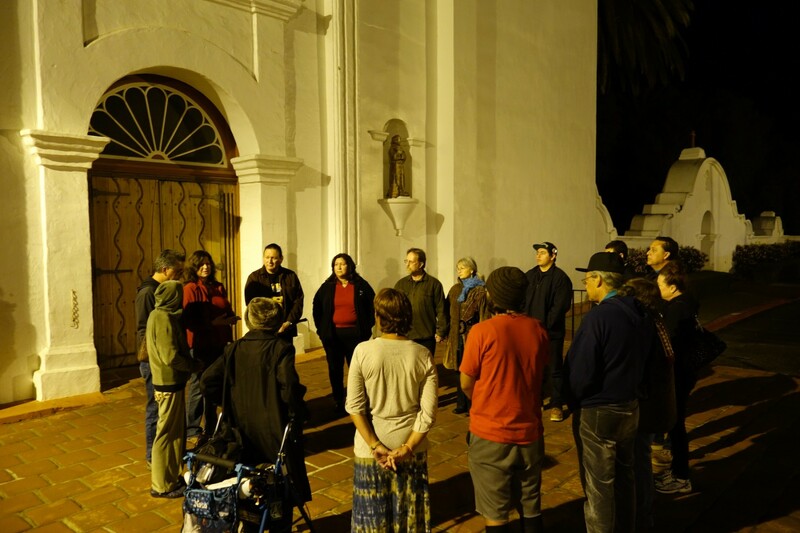 It was dark out, except for the occasional flash of distant lightning. 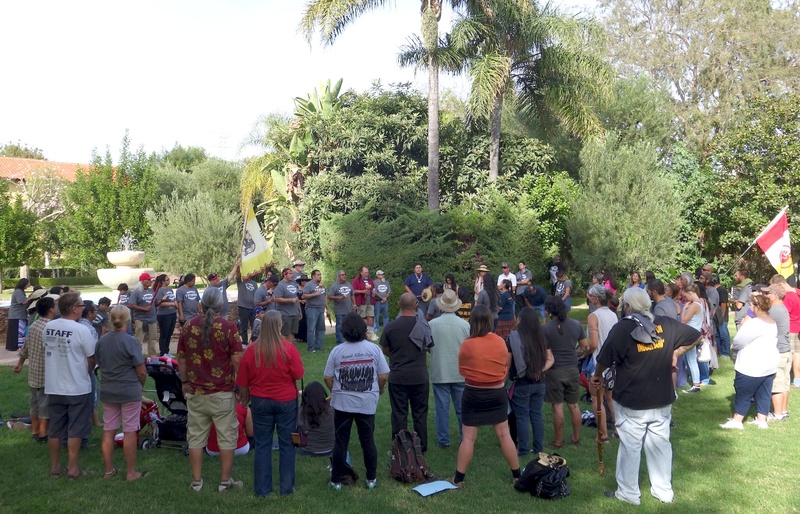 Nevertheless, we soon found ourselves surrounded by a circle of 20 people, standing with us in the cold. Most were tribal members of the San Luis Rey band of Luiseño Indians, though others hailed from the Pechanga band of Luiseño, the San Pasqual band of Kumeyaay, and nearby towns. 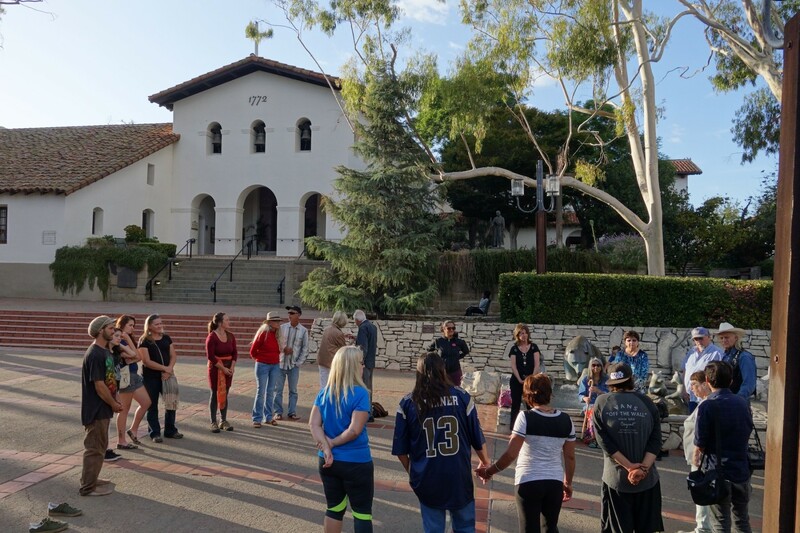 In front of the mission, we were embraced by a warm welcome from Acjachemen women leaders, and many others who had come to join with us for a time of truth telling and healing. 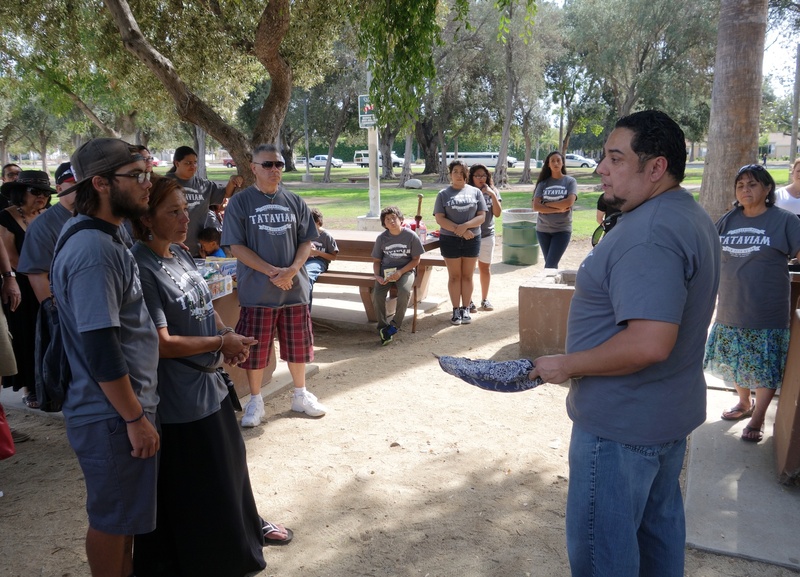 Although the circumstances of our coming together were not happy ones, by the time we left the mission, we felt truly uplifted and inspired. 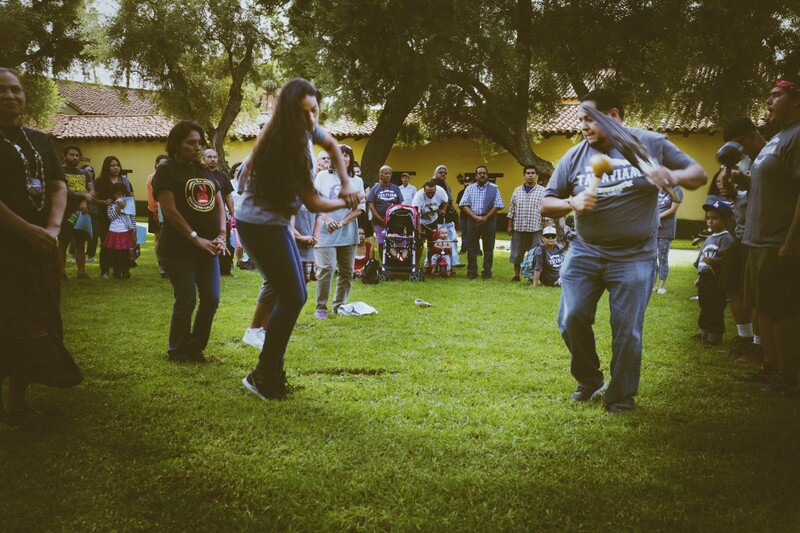 Saturday, October 24th was an unforgettable day. 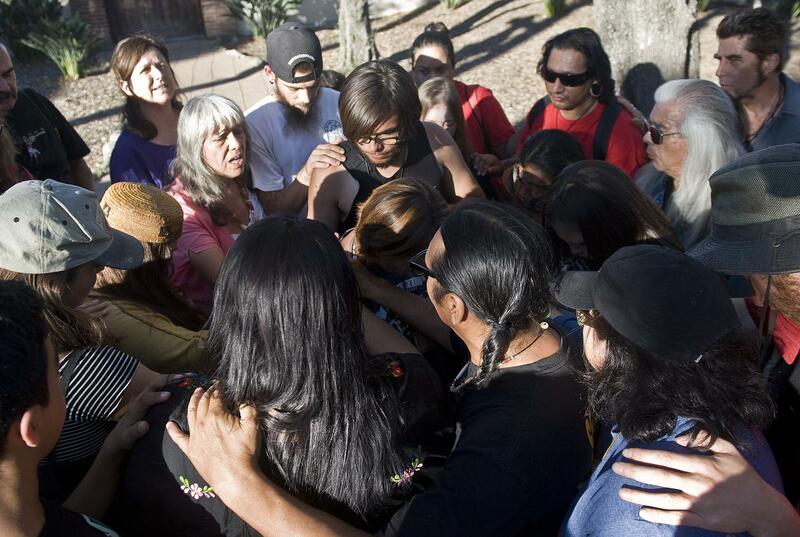 Tataviam families gathered to receive the Walk for the Ancestors, taking over the plaza of Mission San Fernando for three hours with storytelling, traditional songs, and dance. It was the first time in memorable history that the Tataviam community has gathered at the mission grounds for purposes other than a funeral. Joined by other indigenous people and non-native supporters, over 100 of us stood together. 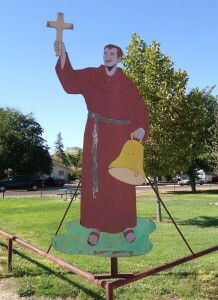 “Father Serra being a saint is not correct. 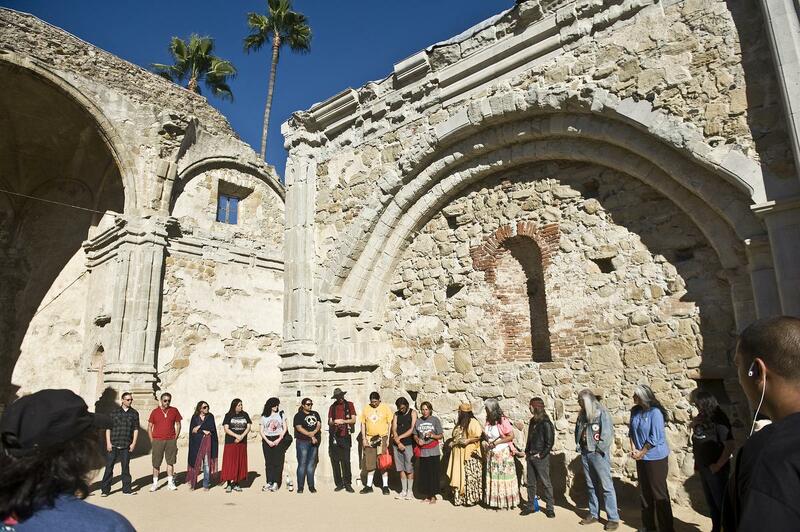 It’s a slap in our faces, it’s disrespect to our cultures, and it’s still saying, from the Pope down, that we’re less than them,” stated Rudy Ortega, Jr, chairman of the Fernandeño Tataviam Band of Mission Indians. 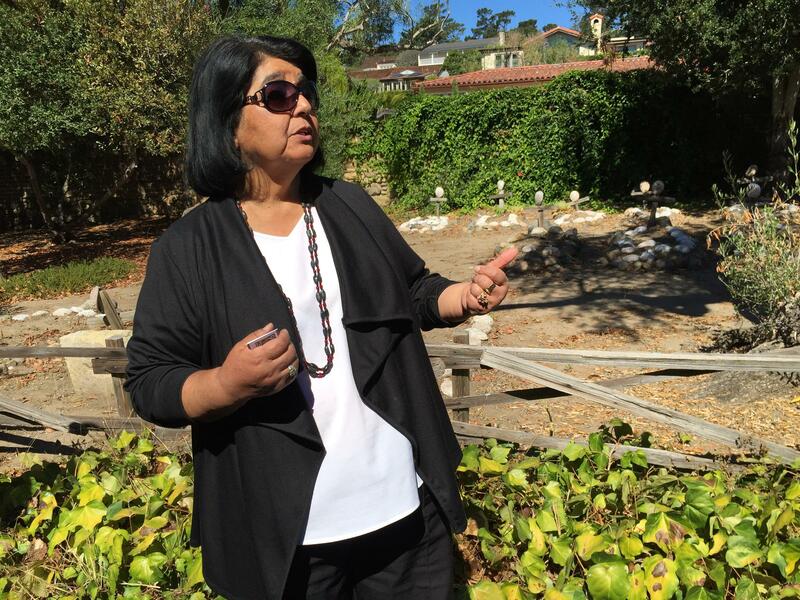 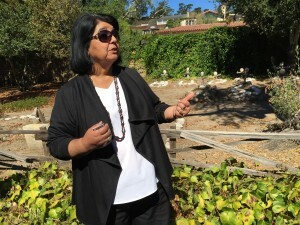 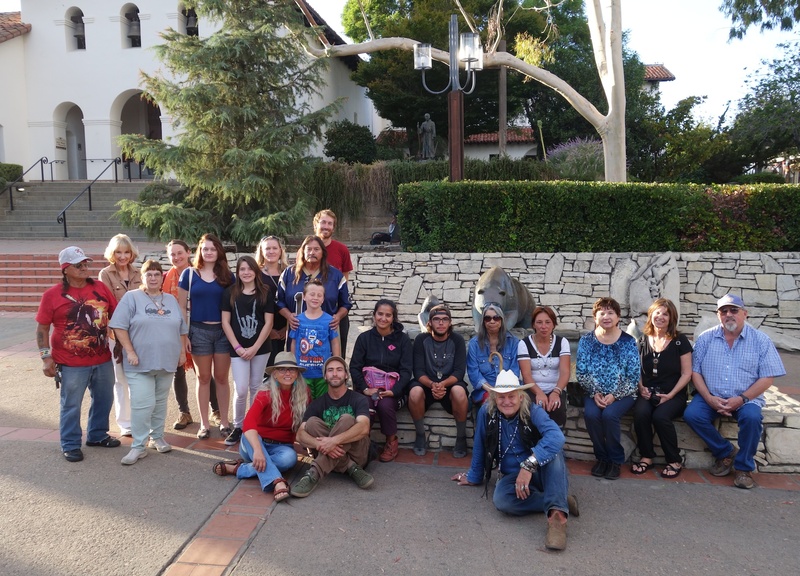 At San Luis Obispo, we were received by a strong circle of Northern Chumash families and other local native and non-native people, some from as far away as the Kern Valley Indian Community in Bakersfield. 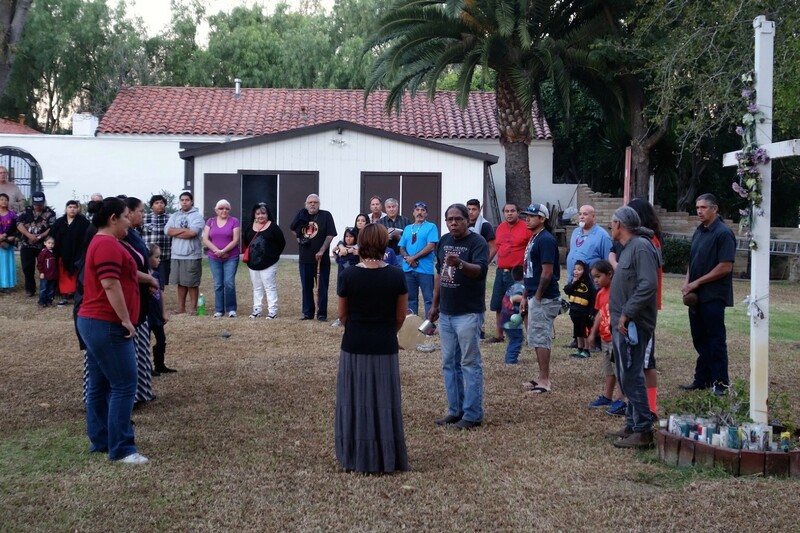 Chairwoman Mona Olivas Tucker of the Yak Tityu Tityu Northern Chumash tribe opened the circle with a prayer in the Chumash language. 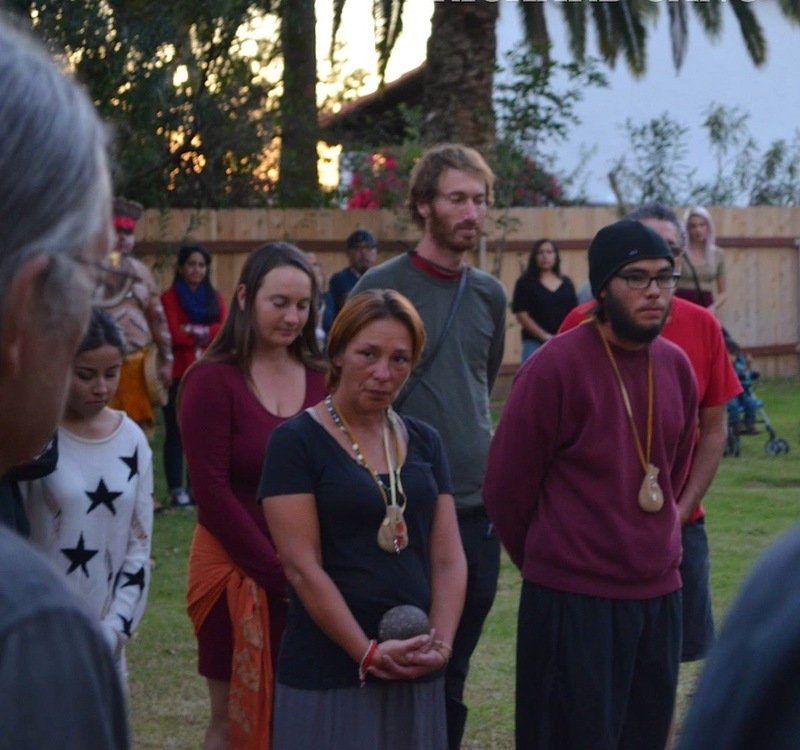 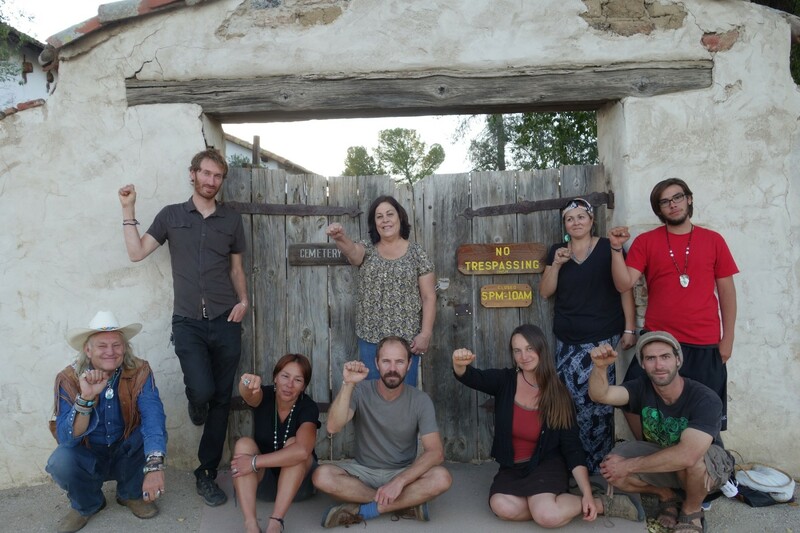 Just before sunset, we gathered outside the San Miguel mission cemetery, holding hands as Patti Dunton of the Salinan Tribe led a prayer and walked around us, singing a Salinan blessing song with a bull kelp rattle. 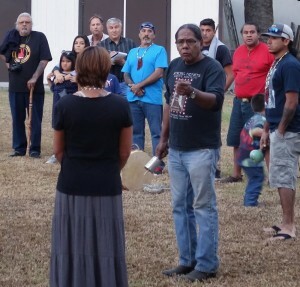 She welcomed us and shared kind words of support and gratitude. 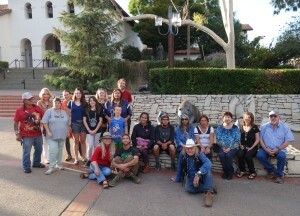 “This is what it really looked like, to be an Indian at Mission San Miguel!” Patti Dunton quipped. 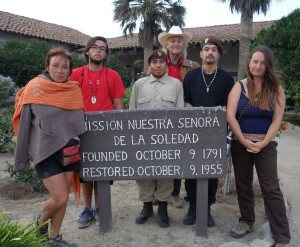 We reached Mission Soledad in the afternoon of September 27th after traversing the bone-dry Salinas River and the vast maze of agribusiness operations that spans the Salinas Valley. 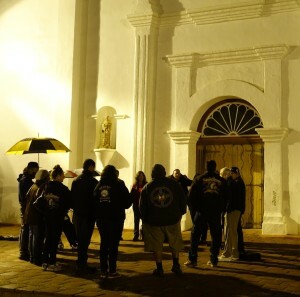 Of all the 21 Missions, this is the one we knew the least about: information about its true history has been scarce and elusive. “These are peoples ancestors, their family relatives, do you understand that?” Caroline told the docent. On the morning of September 23rd, we arrived to Mission Carmel, bracing ourselves for a day we had not been looking forward to. 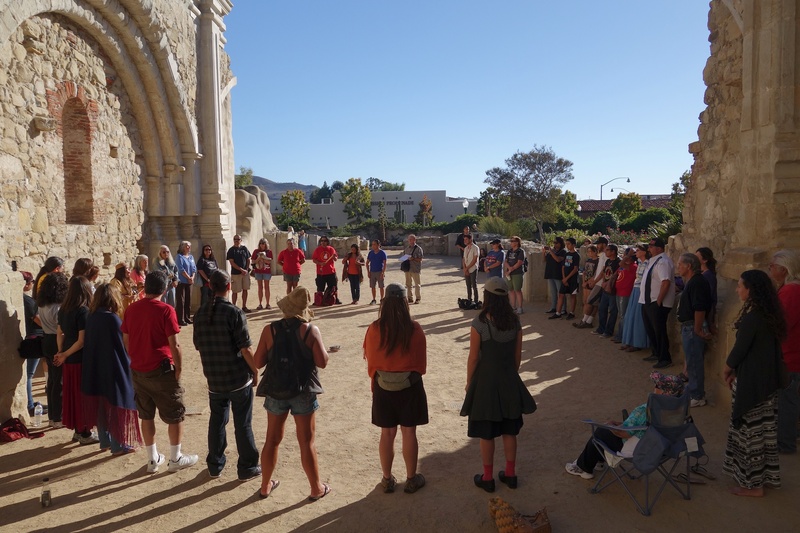 In the Mission courtyard, about 75 people sat in plastic chairs, enthusiastically preparing to watch a live feed of the Canonization Mass for Junipero Serra on a giant TV screen. 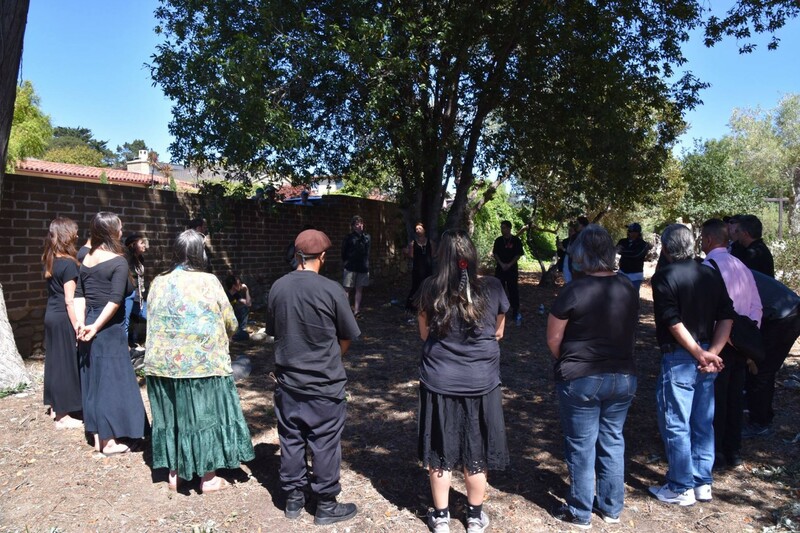 Meanwhile, in the old cemetery where over 3,100 indigenous ancestors lie buried in unmarked graves, we gathered together with Esselen descendants and other native and non-native people, standing in mourning, prayer, and solemn opposition. After a long Sunday’s journey in the sweltering heat, we arrived at San Juan Bautista as the sun was preparing to set on the golden hills surrounding the valley. An eerie billboard on the edge of town reads, “Welcome to History,” depicting a pastoral scene of the Mission and a horse drawn-plough. 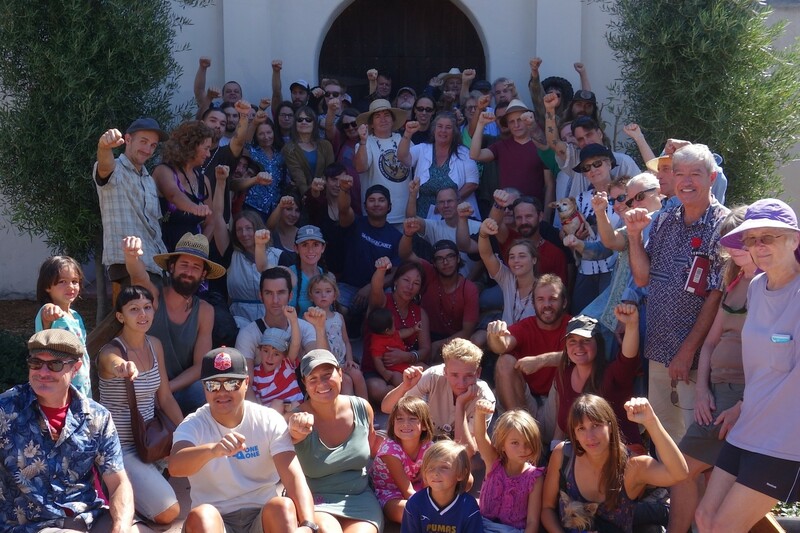 Saturday morning, we stood together with over 80 people of all ages, forming a giant circle at the very place where Mission Santa Cruz once towered over this land. All spoke aloud in turn their reasons for being there. 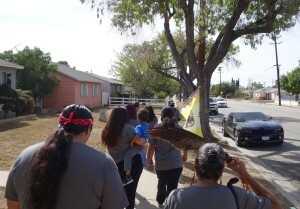 “To offer my deepest respects and my blessings to the walkers who have undertaken this courageous journey,” one woman said. 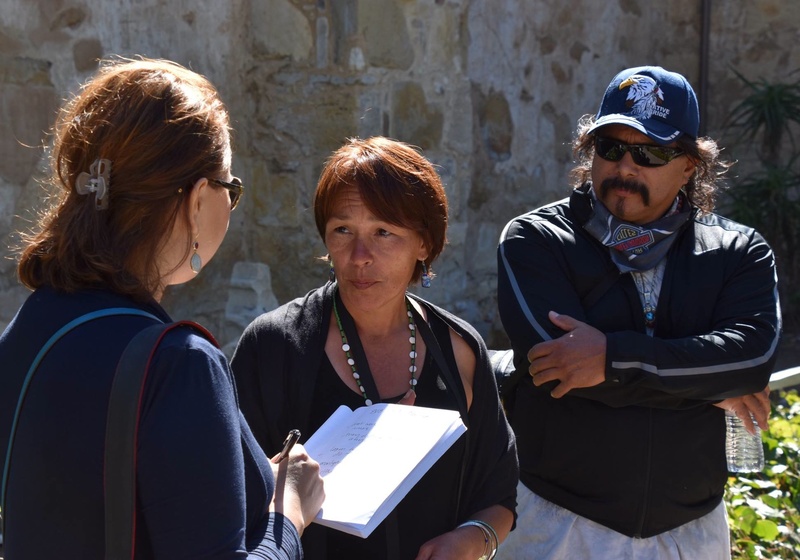 “To acknowledge and grieve the suffering of the indigenous ancestors of this land, and learn the true stories of what happened here,” said another.